Disability & Caring: What could #Peterborough do better to be more #Disability inclusive ? What could #Peterborough do better to be more #Disability inclusive ? What could the City of Peterborough do better to improve the quality of life for it’s Disabled citizens. Following a Twitter conversation I was given the challenge to put into words my thoughts on what would make Disabled people’s lives in Peterborough a bit easier. I can only write from the perspective of what I know, so I apologise straight away to those that have disabilities that I only have limited knowledge of such as sight, deafness, mental illness, learning difficulties. I will leave it to experts in those fields to write an equivalent essay on what would help these groups. A bit about my background. I am the full time carer of my husband who survived a high level spinal infection that left him as a partial tetraplegic. (Paralyses of all four limbs). I also have some knowledge of what is called Learning Disabled these days as my eldest brother lives with severe brain damage caused by a TB/Meningitis as a child, also my aging mother has reoccurring mental health problems and some mobility restrictions. When I worked, I was a professionally qualified manager having gained an MBA and worked in engineering in various safety (NEBOSH qualified ) and project management roles. So my paper will mainly cover the difficulties encountered by those that use a wheelchair to get about. It will cover the following areas, Out and About, Access to Leisure Facilities, Access to Medical Facilities, Housing, and finally City Planning. Living with and accompanying a wheelchair user out and about really opens your eyes as to how inaccessible many areas of life are still to this group. Even when you go out solo you find yourself asking the question, if husband was with me how would we manage in this situation or that. We live near the Serpentine shopping centre, where we often walk/roll to in the good weather to do a bit of shopping or just to get away from our intolerable living conditions to have a coffee. The first obstacle for us is the extremely small lift that is the access point from where we live. Husband can not safely use the lift solo so I squeeze in beside him so that I can press the buttons for him. Coming out of the lift we often see many other disabled people having meals “at” the food court tables. I have put “At” in inverted commas as many can not sit properly at some of the provided tables because they are not at a good wheelchair height and have design obstacles that do not accommodate their footplates. Most of the stores are accessible in access terms for wheelchair users, well until it comes to sale time, when the pile it up high and wide fever takes over and restricts access to many aisles. Biggest bug bear with stores is those such as W.H.Smiths that regularly narrow down walkways with temporary sales stands and exhibits. Recently I was also shocked to find out that Tesco’s had not considered the needs of the wheelchair user when putting in its opticians, they can not accommodate the optical testing of people in wheelchairs. Again who signed that off as Equality Act compliant? May be that is the problem no one is checking for compliance. On a good note, Costa Coffee has removed a rail that ran the length of their counter making access for wheelchairs a lot easier. Having a cup of coffee is not easy as well, as many cups supplied are impossible for those that have weak hands to hold. Many weak fingered like to wrap their hands around the vessel putting their fingers through the handles for extra security. Many designs make this impossible either because the handles are too small or the cup gets too hot to handle. We always use a take-out insulated cup instead with the lid as it is safer. We have only been challenged once for doing this as some cafes differentiate between drink in and take out. The other general thing that people who design shops always seem to never take into account is the height of their counters, nothing worse for an independent chair user not to be able to reach the menus / information / cash payment machines that is available to everyone else. I recently went to Dominos in Hampton Village centre and it had the worst counter height I had ever seen, it was high for anyone under 5ft high. Also I noted that the doors were very difficult for a wheelchair user to open. Toilets for the wheelchair user can also be a nightmare especially if you rely on someone to help you. Cubicles are often too small to accommodate wheelchair plus carer, even though they probably conform with all the statutory building regulations. We also find difficulties with many of the tiny sink types supplied and end up making use of wet wipes. Also no one seems to have thought about where do you put used urine medical devices that quite a lot of wheelchair users use to urinate. Many sanitary deposal bins say female tampons/pads only. Just to note as well, many wheelchair users have also written about the inaccessibility of the new Dyson blade hand dryers. Smaller premises in surrounding villages / suburbs of Peterborough such as small hairdressers and other independent retailers must start to think about providing ramps for wheelchair users to access their premises especially where they have a stepped entrance. Also information displayed outside saying what accommodations they have for chair users, i.e. I will come out to you, provide a ramp, etc. Finally a Question, when at Peterborough Rail Station last, I asked myself, how would an independent wheelchair user get from the station to the rest of town. I think I came to the conclusion that it would be via a taxi or by a very long detour to find a safe place to cross the dual carriageway. The bridge is not accessible, only has a lift on one end. Hope they address this issue during the refurbishment of the station. Do not allow the signing off of lift sizes that will not accommodate a wheelchair user + carer. Also will it take an Ambulance trolley for medical emergencies? Restaurateurs / Café owners can a wheelchair user sit comfortably at your tables, rather than having to have food on laps or sitting sideways on? You supply high chairs for babies so why not an adjustable height table for wheelchair users? Shops do you have a counter height that someone in a wheelchair can access. There needs to be some people employed by the city of Peterborough to check new business premises have complied with accessibility requirements, working with them at the project planning through to completion stages and also help established businesses do better. Every store should do a trial run with store staff being placed in a wheelchair to see what the store looks and feels like from a wheelchair. Toilets need to have a medical grade waste bins and again someone needs to test run facilities actually sat in a wheelchair, asking questions as can I actually use the sink, can I easily get in and out , can I transfer safely from chair to toilet and back. I am also disgusted with the notion that some advocate sitting on the toilet and the sink being in reach to use while being sat on the toilet. Hygiene? Many of us marvelled at the achievements of the paralympians, their dedication and commitment to train and overcome their various limitations. Unfortunately just like the rest of the general public, people that are disabled come in all shapes and sizes. Many would benefit from being able to do some physical activity but are prevented from doing so because leisure facilities supplied in Peterborough, new and old do not make the bit of effort it would require to include everyone and make all welcome. My biggest complaint are the various swimming pools in the area including the hydrotherapy pool at St Georges, have failed to realise that not all disabled people can safely use a hoist or lift chair. If you have a disability that causes,sudden spasms, have limited use of your arms, weak trunk you should not be using such a device as there is a real risk of you falling, slipping causing injury. Instead you should be transferred into a lightweight pool chair and be ramped into a pool, then floated off the chair with the help of a carer. This would also benefit people who walk badly that find steps difficult, probably people with sight issues would also find this type of access easier. I know it would be very unsafe to try and put my severely brain damaged brother in a hoist as he would not sit still, scream the place down, he loves the water, but as he has got older his mobility has worsened meaning that he finds steps very difficult. 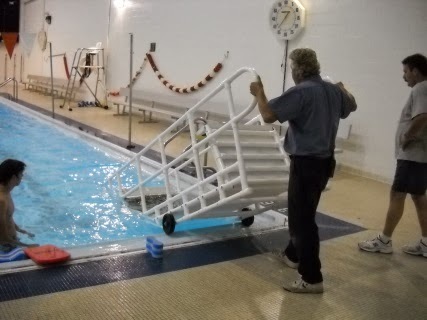 Swimming / water therapy for mobility restricted people should be prescribed on a regular basis the long term health benefits are well documented but largely ignored by community services up and down the country including Peterborough. Gyms also fail to cater for wheelchair users that want to build up their upper body strength, putting in pieces of kit that can only be accessed via an inbuilt seat, rather than a removal one. They could also provide Velcro straps and other aids that would make lifting small weights safe for the disabled. People who organise festivals and special events. Some expect all wheelchair users to be able to park on rough / sloped / gravel / grassed ground and still be able to decamp from their wheelchair accessible cars and traverse to the event. It even happened at the mobility show a couple a years ago when we went. Not everyone is a Paralympian and do not have the strength to do that. Cinemas that insist on wheelchair users sitting at the front. No good for my husband with all the metal work in his neck he can not lift his head that far for that long. There are still a lot of barriers to going out in a wheelchair, that as an able bodied person you would not necessarily think about. 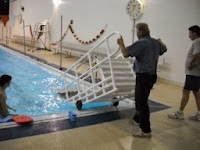 Pools should invest in removable ramps and light weight pool chairs. Gyms to make as many pieces of equipment as possible accessible. People that organise events should road test their facilities via a wheelchair. Cinema owners should take out some seats at the end of some rows to accommodate wheelchair users at various sitting positions in the cinema. Most Doctors surgeries in Peterborough are for the most part accessible. Many do not have a hoist available for couch examinations. Many consulting rooms are very small with inadequate door widths for comfortable access. Waiting rooms sometimes fail to make safe waiting areas available for wheelchair users, too many standard chairs in the way. Also for those that can walk with difficulty, no higher seats to make getting in and out of easier. Dentists & Opticians are for the most part inaccessible to visit. Even if you can get through the door, the consulting rooms are full of immovable equipment which make it impossible for the wheelchair user, unless can walk a little. Hospitals in Peterborough are pretty accessible as they are generally built to take hospital beds in corridors etc. Many mistakes were made at PCH, some of which have been resolved as building work has been completed. Still there are very long corridors in PCH with quite a few inaccessible doors that create barriers to the wheelchair user. Using diagnostic machines for x-rays etc is still an absolute nightmare for the mobility impaired. The equipment being used is just not transfer friendly. NHS Wheelchair services were transferred out to a company in Essex. This has been an utter disaster from where we are sitting. They have such a huge area they can not possibly get to know their clients. They seem to be utterly thrown by clients that have the top level of specialised need. We have been trying to get a loan chair for over three months now that I dare sit Husband in for any length of time so that his oh so essential chair can be repaired. We have had drivers turn up without any tools, without head rest, leg raisers, chair recliner etc. Next visit will be the fifth attempt at getting it right so that we can get husbands chair fixed of his horrible noisy recline mechanism which sounds like it is going to fail at any moment. The cost of the petrol alone must be horrendous. Private Physiotherapists in Peterborough generally do not cater for people in wheelchairs, some will do home visits. But at their premises no hoists. We used to go to a business run out of a house that had recently gone through planning permission that no one had said to them what about accessible access? We shamed them into buying a temporary ramp so that we could get inside through the high stepped door that is typical of domestic house builds. Inside all of the physios we visited no hoists or wider couches which the disabled usually need. Another just around the corner from us is in a relatively new business park, where there is no disability designated parking and the entrance door is impossible for an independent wheelchair user to use. 1. All of these businesses whether private or NHS need to do the wheelchair test. 2. Someone at the council needs to enforce accessibility at the planning stage, for both refurbishments and new builds. 3. Peterborough NHS needs to take back its wheelchair service. Social Housing. You apply to join the local waiting Iist and if you have a medical need will be assessed by a housing OT. This is where it seems to go wrong, as the remit of the OTs seems to be to try and under remit your disability as much as possible so that they can make you look like you are being overly fussy about where you live. You will encounter phraseology such as, “of course you will need to consider ground floor flats” , “you know we do not have many bungalows in our stock”, etc etc. The approach is not to document what you actually need but how much they think they can get away with. This has led to me seeing disabled people all around me in places that I know they, family and their care workers must be struggling in. The council does not seem to grasp the difference between someone that needs level 2 housing and level 3 wheelchair accessible housing. Also that within level 3 there is two further categories, firstly the independent wheelchair user that is either living solo or with family and secondly the dependant wheelchair user where the home is also a place of work for care-workers. The latter needing the greater “out of the box” thinking as standard wheelchair home will not necessarily work because of the possible extra hygiene and medical requirements. Peterborough like many councils up and down the UK is badly letting down it most vulnerable in this respect. Private Renting. If you are a dependant wheelchair user you will be extremely lucky to find a private landlord that is willing to give you a secure tenancy of five years plus so that you can apply for a disability grant to make the changes you will need to make a safe accessible home. It is about time there was a requirement of multiple property landlords that have 10+ properties to make the 1 in every 10 accessible to a wheelchair user. New Builds. Planning departments should insist that large new developments include an appropriate mix of all building types. Extra Care / Care Homes / Nursing Homes. Much has been said in the press lately about the problems people face with dementia. A horrible disease that took my maternal grandmother many years ago. I have become increasing worried lately for our older folk and disabled that do not have this disease as their liberties are being taken away in the institutions above in the name of keeping those with that disease safe. These institutions should be very wary of this, it is very difficult to accommodate the very varied needs of those in these housing options. I have also become increasingly aware that families are putting their loved ones in extra care facilities because of the degree of independent supported living it gives as a more socially palatable solution as opposed to the guilt of putting loved ones in a care home and all the negative associations that has. Even when this is not suitable because of advancing dementia, lack of facilities to cater for complex medical problems and from where I am sitting local councils are duplicitous in this. Every area needs to have a mix of different facilities that cater for the different difficulties people find in later life or when disability is involved. I personally do not think Peterborough has got this balance right at present. People are being put in places according to next on the list, emergency placements etc instead of what is right for them and their condition. Someone at the council needs to head up a task force with social services and NHS continuing care people, looking at who is on the housing list with what medical / disability needs. Then a plan needs to be put in place as to what measures can be taken in conjunction with those citizens to house them according to need and not what the council can get away with. This would include the acquisition of a small amount of privately owned bungalows to refurbish, new builds and existing Housing Association properties. Someone needs to deter families from putting disabled & elderly relatives inappropriately in extra care facilities. Checks need to be made prior to move regarding accessibility, hoist availability, specialised care worker availability. OTs at the council need more training in the difference between someone needing independent level 3 wheelchair accessible housing and those that need specialised dependant housing to house care-workers as well as tenants. Private landlords need to be engaged to try and persuade a number of them to cater for wheelchair applicants. If I were to write a school report about accessible planning in the City of Peterborough it would say “could do better”. In all aspects of planning questions should be asked as to how does my decision affect a wheelchair user? can a wheelchair user access this business ? will this pavement surface I am signing off be comfortable for a chair user to traverse? Should this business owner being doing more to make this planning application more disability friendly ? Has the business done the wheelchair access test ? Should this lift be big enough to accommodate an ambulance trolley ? Can a wheelchair user get out to a position of safety quickly and easily ? should this buildings ceiling be capable of taking a ceiling hoist ? Is this public access room big enough to accommodate a person in a wheelchair? Should this new small business be allowed to have their business upstairs with no access? Etc etc…. So there you have it some of the things Peterborough could do better to make Peterborough a more inclusive city. Care in Crisis my take on things.